AS THE WORLD IS BECOMING MORE COMPLEX AND GLOBAL, the issues of corporate culture and subculture are more relevant to leadership and organizational performance. Leadership not only creates culture but is the central force in managing culture evolution and change. This new and revised edition of Schein′s groundbreaking book shows how the management of cultural issues now involves the alignment of national, corporate, and occupational cultures. Effective organizations not only need to decide how strongly they want their corporate culture to be based on the rate of technological change, but should also be concerned about the management of the multiple subcultures that arise with increasing technological complexity. More than ever, leaders must have a clear understanding of how to manage in a multicultural environment. Written for practitioners, Schein reinforces the emphasis on understanding the nature of culture before one leaps into culture change programs, especially in an age where mergers, acquisitions, joint ventures, and foreign subsidiaries make culture management more difficult. This well–timed revision of The Corporate Culture Survival Guide is the ideal resource for leaders looking to figure out how their corporate culture can aid or hinder current performance and future effectiveness. Reflecting the myriad changes in the field, this new and revised edition contains new examples that target the international, nonprofit and public administration sectors; highlights the effects of globalization, mergers, and technology on organizations; and features a new chapter on the competencies managers need to foster in order to cultivate an effective corporate culture. 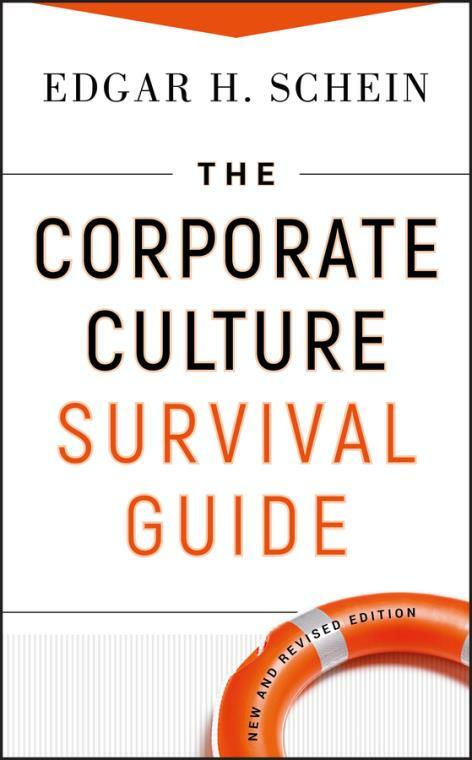 The Corporate Culture Survival Guide retains Schein′s hands–on methods of observation, interview, and intervention to uncover the nuances as well as the details and dynamics of an organization. The book also contains an appraisal of corporate culture on three levelsbehaviors, values, and shared assumptionsand shows how each level affects change initiatives. Providing a clear understanding of the nitty gritty of culture dynamics, this essential resource is filled with new illustrative case studies that clearly show what successful change looks like and demonstrates how to dismantle an ineffective or dysfunctional culture. PART ONE: THE STRUCTURE AND CONTENT OF CULTURE. Chapter Two: What Is Culture Anyway? Chapter Three: What Are the Elements and Dimensions of Organizational Culture? Chapter Five: When and How to Assess Your Culture. PART TWO: THE DYNAMICS OF CULTURE FORMATION, EVOLUTION, AND CHANGE. Chapter Six: Cultural Learning, Unlearning, and Transformative Change. Chapter Seven: Culture Creation, Evolution, and Change in Start–Up Companies. Chapter Eight: Culture Dynamics in the Mature Company. Chapter Nine: Mid–Life Crisis and Potential Decline. Chapter Ten: When Cultures Meet: Acquisitions, Mergers, Joint Ventures, and Other Multicultural Collaborations.